With the release of Multi Theft Auto: San Andreas 1.0, the older MTA:SA Race mods have become obsolete! The latest version of MTA:SA features a fully customizable Race mode that includes all of the features of the older MTA:SA Race mods, and many more. Rather than having a separate mod, Race now exists as a resource in MTA:SA 1.0 that utilizes MTA's powerful game scripting system. What this means is that Race is now fully editable and customizable, allowing any features imaginable to be added and any existing feature to be altered. The latest version of the Race resource is well-polished and includes all of the features that MTA:SA Race fans are used to. For this reason, MTA:SA 1.0 (along with the Race resource) can be considered as a superset of the older versions of MTA:SA Race. Since the Race mode in MTA:SA 1.0 is a resource, it will never become obsolete! Resources can be developed by any member of the community, allowing endless updates and fixes to be made. New releases of MTA:SA will only expand upon the current scripting functionality, guaranteeing compatibility with all the current features. No more jerky cars! Other players' vehicles now move as smoothly as you would expect them to, preventing unexpected collisions caused by vehicle jerkiness. There is also an option to disable vehicle collisions so that players can race without having to worry about bumping into one another. Click here to view a video of a race in MTA:SA 1.0. MTA:SA 1.0's server is optimized to use less bandwidth and achieve higher performance than the old MTA:SA Race server, while offering improved stability. The server now supports up to 128 players, up from 32 players in MTA:SA Race. Custom vehicle and object models in Race. The powerful scripting system in MTA:SA 1.0 and the design of the Race mode allow add-ons and other mods to be included in the game. Race's add-ons system let's developers create new features for Race that can easily be added or removed by server admins. Some of the current add-ons include a Need For Speed style NOS feature and a map ratings system. 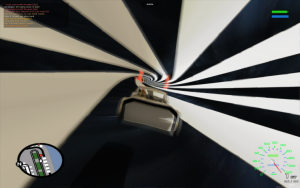 There is also a speedometer resource that adds a stylish new on-screen speedometer. MTA now fully supports vehicle, as well as object modifications through it's resource system. This means that players download the models the server is using automatically, without having to install anything themselves. Custom object models allow for unique tracks and environments for players to race in, while custom vehicles ensure everyone sees the vehicles the server is using. Click here to view a video of custom models in MTA. The new map editor allows you to create race maps with ease, while offering many new and advanced features not present in the old race editor. Race's new GUI and spectator system. Although *.map files now have a different syntax, it's easy to convert all your old MTA:SA Race maps for full compatibility with MTA:SA 1.0. You can download our official batch converter here. This page was last modified on 25 August 2009, at 10:17.